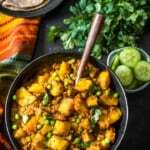 Instant Pot aloo matar – this simple peas and potato curry recipe is perfect for days when you want a fuss-free meal that is easy to make and delicious. Pair it with roti or rice to make it a complete meal. 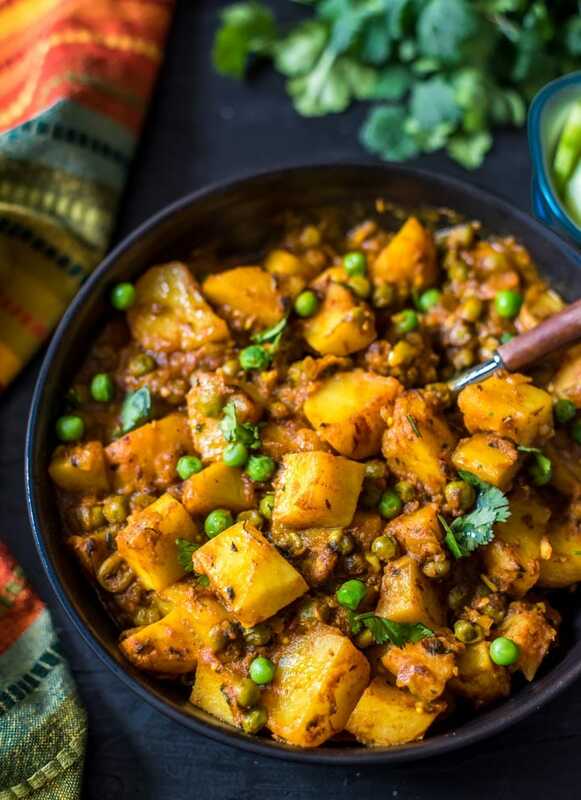 If you are new to Indian cooking, Aloo matar would be a good recipe to get started with. I say this because I started my culinary journey with aloo matar. I was all of 9 years old and with a little help from my older cousin, I was able to cook this simple dish with success and I assure you that you can too. 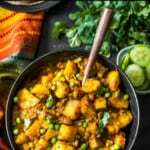 Aloo matar is made by cooking potatoes and peas in an onion-tomato gravy infused with spices. The cool thing about this dish is that it allows you to skip most of the spice powders, if you don’t have them handy and yet have a great tasting dish. That’s because some vegetables like potatoes and peas taste delicious with just salt and chili powder. 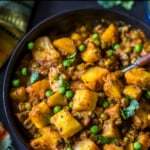 This recipe can be used by dry aloo matar as well as the one with gravy. You have to adjust the amount water used as explained in step 6 below. Set the Instant Pot to ‘Saute’ mode and adjust the setting to ‘More’. When the display reads ‘Hot’, add oil. When the oil heats up add cumin seeds (jeera) and hing (if using). When the cumin seeds start to splutter, add carom seeds (ajwain) and onions and fry them till the onions have softened up and turned transparent (takes about 6-8 minutes). Add the minced garlic, grated ginger, along with coriander, cumin and turmeric powder. Mix well and saute it for about 30 seconds. Add pureed tomatoes and let the mixture come to a boil (takes about 5 minutes). Add potatoes and peas along with 1/2 cup water. Mix well and place the lid. Close the vent and set it to the sealing position. Note: use 3/4 to 1 cup of water instead of 1/2 cup if you like a curry-like consistency. Pressure cook on high for 2 minutes. Once the cooking cycle is complete, immediately release pressure by moving the vent to the venting position. Open the lid and add kasoori methi (dried fenugreek leaves) along with garam masala. Garnish it with chopped cilantro, if desired. Mix well. Serve hot with rice or ghee laden rotis. Pressure cooking cuts the cooking time for potatoes. It cooks in 2 minutes using an Instant Pot compared to 15 – 20 minutes over the stove top. If you are pressure cooking, cut the potatoes in at least 2-inch cubes so that it will retain its shape even after it is pressure cooked. If you are short on time, you can replace the onion-tomato gravy with marinara sauce. I have done that like a million times to speed things up and the dish still tasted great. Make sure to cook the marinara sauce till it comes to a boil before you add the potatoes. You can use frozen peas as is – no need to thaw. Most Aloo matar recipes don’t call for ajwain (carom seeds) and hing (asafoetida). You can skip it but I love how it adds more depth and dimension to this dish. When using dried fenugreek leaves, roast them for a minute or two in a pan for enhanced flavor and aroma. To make it South Indian style or if you prefer a creamy Alu matar, add 1/4 cup coconut milk along with potatoes. Rajma masala – Red kidney beans cooked in an onion-tomato based gravy. Palak Paneer – Spinach and Cottage cheese cubes combined in a velvety smooth sauce. Dal fry – a delicious lentil curry which tastes great with jeera rice. Tadka dal – a one-pot lentil soup that you can make in minutes. 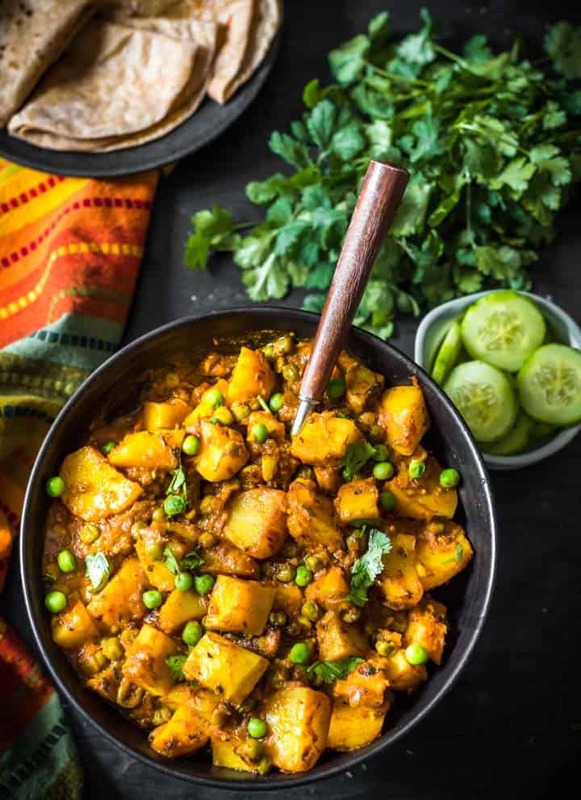 Instant Pot Aloo matar is a delicious potato and peas curry that you can make in 30 minutes. Serve with ghee laden rotis to make it a complete meal. Pressure cook on high for 2 minutes. Once cooking is complete, immediately release pressure by moving the vent to the venting position. Pressure cooking cuts the cooking time for potatoes. It cooks in 2 minutes using an Instant Pot compared to 15 minutes over the stove top. If you are short on time, you can replace the onion-tomato gravy with marinara sauce. Make sure to cook the marinara sauce till it comes to a boil before you add the potatoes. You can use frozen peas as is - no need to thaw. 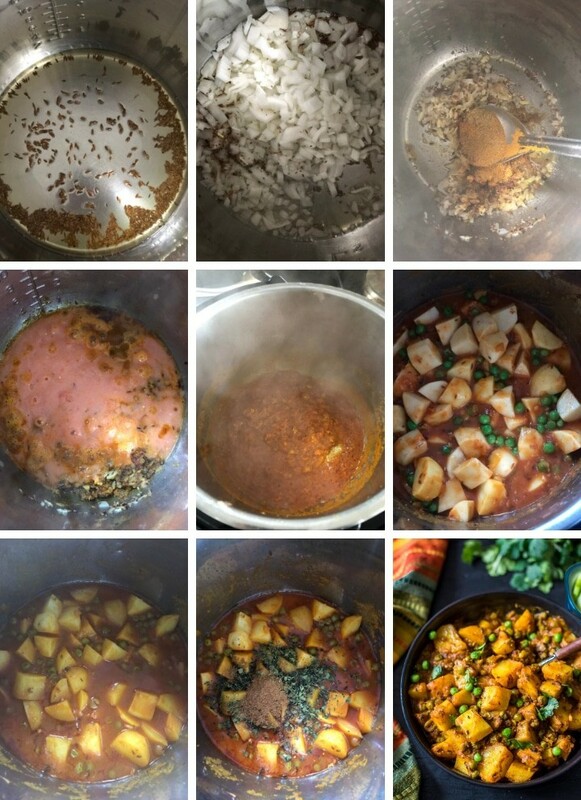 Most Aloo matar recipes don't call for ajwain (carom seeds) and hing (asafoetida). You can skip it but I love how it adds more depth and dimension to this dish.